Our note: At home, we love it! Mmm… Fried garlic mushrooms on a rustic bread toast. It is an easy yummy tapa as well. *Our notes: Mushroom buttons works pretty well for a cuptapa size. 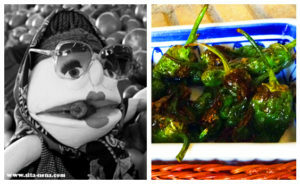 Our note: chopped onion instead of garlic cloves, it makes a tasty tapa as well. 1. Remove stems from mushrooms, usually stems are dirty. 2. Wash all the cups well and cut into thin slices. 3. Peel the garlic cloves and cut into thin slices. 4. Heat olive oil in a saucepan. Sauté and stir the garlic cloves for several minutes. Add sliced mushrooms and dried chillies. 5. Cook over a high heat, stir everything nonstop until sliced mushrooms got brown (it means well done). 6. Pour the fried garlic mushrooms into a bowl, mix gently with a spoon. Add salt, to taste. Cover the bowl with aluminium foil. 7. Garlic mushrooms should be served warm. 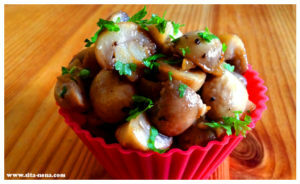 CUPTAPA: Fill the silicone wrappers (cupcake size) with the garlic mushrooms. Sprinkle chopped fresh parsley and a bit of ground black pepper (optional). Our note: The silicone wrappers (cupcake size) are the perfect unit for a tapa. Agaricus bisporus /Wikipedia, the free encyclopedia/ is an edible basidiomycete mushroom native to grasslands in Europe and North America. It has two color states while immature, white and brown, both of which have various names. When mature, it is known as portobello mushroom, often shortened to just portobello. The common mushroom has a complicated taxonomic history. It was first described by English botanist Mordecai Cubitt Cooke in his 1871 Handbook of British Fungi, as a variety (var. hortensis) of Agaricus campestris.